Helicobacter pylori is the first bacterium formally recognized as a carcinogen and is one of the most successful human pathogens, as over half of the world’s population is colonized by the bacterium. H. pylori-induced gastroduodenal disease depends on the inflammatory response of the host and on the production of specific bacterial virulence factors. The study of Helicobacter pylori pathogenic action would greatly benefit by easy-to-use models of infection. In the present study, we examined the effectiveness of the larvae of the wax moth Galleria mellonella as a new model for H. pylori infection. G. mellonella larvae were inoculated with bacterial suspensions or broth culture filtrates from either different wild-type H. pylori strains or their mutants defective in specific virulence determinants, such as VacA, CagA, CagE, the whole pathogenicity island (PAI) cag, urease, and gamma-glutamyl transpeptidase (GGT). We also tested purified VacA cytotoxin. Survival curves were plotted using the Kaplan-Meier method and LD50 lethal doses were calculated. Viable bacteria in the hemocoel were counted at different time points post-infection, while apoptosis in larval hemocytes was evaluated by annexin V staining. We found that wild-type and mutant H. pylori strains were able to survive and replicate in G. mellonella larvae which underwent death rapidly after infection. H. pylori mutant strains defective in either VacA, or CagA, or CagE, or cag PAI, or urease, but not GGT-defective mutants, were less virulent than the respective parental strain. Broth culture filtrates from wild-type strains G27 and 60190 and their mutants replicated the effects observed using their respective bacterial suspension. Also, purified VacA cytotoxin was able to kill the larvae. The killing of larvae always correlated with the induction of apoptosis in hemocytes. G. mellonella larvae are susceptible to H. pylori infection and may represent an easy to use in vivo model to identify virulence factors and pathogenic mechanisms of H. pylori. The experimental model described can be useful to screen a large number of clinical H. pylori strain and to correlate virulence of H. pylori strains with patients’ disease status. Helicobacter pylori is a gram-negative, microaerophilic bacterium that colonizes approximately 50% of the world’s population. H. pylori infection causes chronic gastritis, which is asymptomatic in the majority of carriers but may evolve into more severe disease, such as atrophic gastritis, gastric and duodenal ulcers, mucosa-associated lymphoid tissue lymphoma and gastric adenocarcinoma ,. H. pylori-induced gastroduodenal disease depends on the inflammatory response of the host and on the production of specific bacterial virulence factors, such as urease, the vacuolating cytotoxin VacA, gamma-glutamyl transpeptidase (GGT), and a 40-kbp pathogenicity island (cag PAI) encoding the 120–145 kDa immunodominant protein cytotoxin-associated gene A (CagA) as well as a type IV secretion system that injects CagA into the host cell –. The availability of a large number of genome sequences of H. pylori strains isolated from asymptomatic individuals and patients with gastric cancer, peptic ulcer disease, or gastritis provides the opportunity to identify novel virulence factors and mechanisms of diseases –. In vitro models of monolayers of gastric mucosal cells, either primary cultures or gastric adenocarcinoma cell lines, primary cultures of monocytes or lymphocytes have been extensively used to study H. pylori pathogenesis but have not been able to reproduce completely clinical outcomes associated with H. pylori infection ,–. Moreover, rodent models of wild-type mice, knock-out or transgenic mice and mongolian gerbils have been used to reproduce H. pylori persistent infection and disease –. However, these mammalian models are very expensive and time-consuming because they require specific animal facilities not widely accessible to all research groups, a large number of animals in order to obtain statistically significant results, and a formal approval by the local Ethics Committee. Invertebrate hosts, such as nematodes or insects, can be used as alternative models of infection. Caenorhabditis elegans has been used as an infection model for a diverse range of bacterial and fungal pathogens ,. However, C. elegans cannot survive at 37°C and lacks functional homologues of cellular components of the mammalian immune system, such as specialized phagocytic cells . Models of infection based on insects, such as Drosophila melanogaster and Galleria mellonella (wax moth) larvae offer the advantage that they can survive at 37°C. For example, a transgenic Drosophila model with inducible CagA expression has been used to study the signal transduction pathways activated by CagA ,. In addition, insects possess specialized phagocytic cells, also known as hemocytes , which resemble mammalian phagocytes because they are able to engulf pathogens and kill them by using antimicrobial peptides and reactive oxygen species through proteins homologous to the NADPH oxidase complex of human neutrophils . Moreover, genes that are known to mediate recognition of pathogen-associated molecular patterns, such as at least three different toll-like receptors and the transcription factor nuclear factor-κB (NFkB), and apoptosis-related signaling, such as caspases-1, −3,-4, and −6, are expressed in G. mellonella larvae ,. Although G. mellonella does not reproduce all aspects of mammalian infection, their larvae are increasingly used as mini-hosts to study pathogenesis and virulence factors of several bacterial and fungal human pathogen for the following advantages: i) low overall costs of breeding large numbers of larvae and worldwide commercial availability; ii) adaptation to human physiological temperature (37°C); iii) presence of a well-characterized phagocytic system; iv) availability of a comprehensive transcriptome and immune gene repertoire ,–. G. mellonella larvae were shown to be susceptible to infection with several pathogens, including Pseudomonas aeruginosa, Staphylococcus aureus, Francisella tularensis, Burkholderia mallei, Acinetobacter baumannii, Klebsiella pneumoniae, Cryptococcus neoformans, Candida albicans and Campylobacter jejuni. Also, C. jejuni bacteria have been observed in the haemocoel and gut of infected larvae, and have been demonstrated to induce damage to the midgut . In this study, we demonstrate that G. mellonella is susceptible to infection with H. pylori and may represent a valuable model to identify virulence factors and pathogenic mechanisms of H. pylori. A total of eleven H. pylori strains were included in this study. In particular, we used: a) the wild-type H. pylori strain G27 (VacA+/cag PAI+/urease+) and its isogenic mutants in which the cagA (G27ΔcagA) or cagE (G27ΔcagE) gene or the entire cag PAI (G27ΔcagPAI) were disrupted by insertional mutagenesis ,; b) the wild-type H. pylori strain 60190 (ATCC 49503; VacA + s1/i1/m1/cag PAI+/urease+) and its isogenic mutants in which vacA (60190ΔvacA), or cagA (60190ΔcagA), or cagE (60190ΔcagE) were disrupted by insertional mutagenesis , as well as its urease-negative spontaneous mutant urease (60190 Urease-negative) ; c) the mouse-adapted H. pylori strain M5 and its GGT-defective isogenic mutant (M5ggt::aph) in which ggt was disrupted by insertional mutagenesis . Bacteria were cultured on Columbia agar supplemented with 10% defibrinated horse blood, 1% Vitox and Skirrow’s supplement under microaerophilic conditions in anaerobic jars with microaerobic System CampyGen (all from Oxoid, Milan, Italy) at 37°C for 3 days. BCFs were prepared as previously described ,. Briefly, bacteria were grown in Brucella broth medium supplemented with 1% Vitox and Skirrow as well as 5% heat-inactivated fetal calf serum (FCS; Sigma-Aldrich, Milan, Italy) in anaerobic jars with microaerobic System CampyGen with gentle shaking (150 oscillations/min) for 24–48 h at 37°C. When bacterial suspensions reached 1.0 optical density units at 450 nm (corresponding to a bacterial concentration of 5 × 108 colony-forming units (CFUs/ml), bacteria were removed by centrifugation (12,000 g for 15 min), and the supernatants were sterilized by filtering through a 0.22-μm-pore-size cellulose acetate filter (Sartorius Minisart SM 16534, Sigma-Aldrich) to obtain BCFs. VacA (s1/m1 genotype) was purified by ammonium sulphate precipitation and gel filtration chromatography from wild-type H. pylori 60190 strain grown in Brucella broth in which foetal calf serum was replaced by 0.2% β-cyclodextrins (Sigma-Aldrich) ,. Purified VacA was stored in melting ice and, immediately before use on G. mellonella larvae, was activated or not by dropwise acidification to pH 3.0 with 0.2 N HCl. Vacuolating activity of purified VacA was determined by means of neutral red uptake as previously described . In order to compare the effects obtained with either purified VacA or VacA+ BCF, it must be taken into account that the vacuolating power on cultured human epithelial cells of VacA+ BCF prepared as above from 60190 H. pylori strain was equivalent to that exhibited by a final concentration of 1.2 μg/ml of activated purified VacA ,. To assess the virulence of H. pylori in vivo using the G. mellonella insect model of infection , caterpillars weighing between 200 mg and 400 mg and maintained on wood chips in the dark at 8-10°C were employed in all assays. No ethical approval was required for the study because there was no use of a mammalian model of infection and animal house. Briefly, bacteria were harvested from a culture by rolling a moistened swab over the plate into 1 ml of phosphate-buffered saline (PBS) and adjusted to an OD450 of 1.0. A Hamilton syringe was used to inject 10 μl aliquots of serially diluted bacterial suspensions (from 1 × 107 to 1 × 104 CFUs) or BCFs collected from 1 × 106 CFUs into the hemocoel via the left proleg of each larva. Bacterial colony counts on 10% blood Columbia agar plates under microaerophilic conditions were used to confirm all inocula of either bacterial suspensions or BCFs. Control larvae were either injected with 10 μl of PBS in order to measure any potential lethal effects of the injection process, or not injected to measure the effects of the incubation procedure. Ten G. mellonella larvae were infected for each experimental condition, with each experiment repeated at least 3 times. After injection, larvae were incubated in petri dishes at 37°C in standard aerobic conditions and survival was recorded at 24 h intervals for 96 h. Larvae were considered dead when they displayed no movement in response to gentle prodding with a pipette tip . To determine the numbers of viable bacteria in larvae at 0, 24, 48 and 72 h post-infection, larvae were chilled on ice for 10 min. The bottom 2 mm of each larva was aseptically removed and haemocoel was drained into a sterile 1.5 ml microcentrifuge tube. For enumeration haemocoel was serially diluted in PBS and the bacterial load per larva was quantified by enumeration of CFUs on Columbia Blood Agar plates (CBA) supplemented with 10% defibrinated horse blood, 1% Vitox and Skirrow’s supplement and incubating under microaerophilic conditions in anaerobic jars with microaerobic System CampyGen (Oxoid) at 37°C for 48-72 h.
Hemocytes were prepared from hemolymph of G. mellonella larvae as described by Bergin et al. . Plasma membrane asymmetry existing in living cells is lost on apoptosis and it is commonly detected with probes, like Annexin V, interacting strongly and specifically with phosphatidylserine. In order to assess apoptosis induction on G. mellonella hemocytes, (FITC)-conjugated annexin V (Pharmingen San Diego, CA) staining has been performed as described . 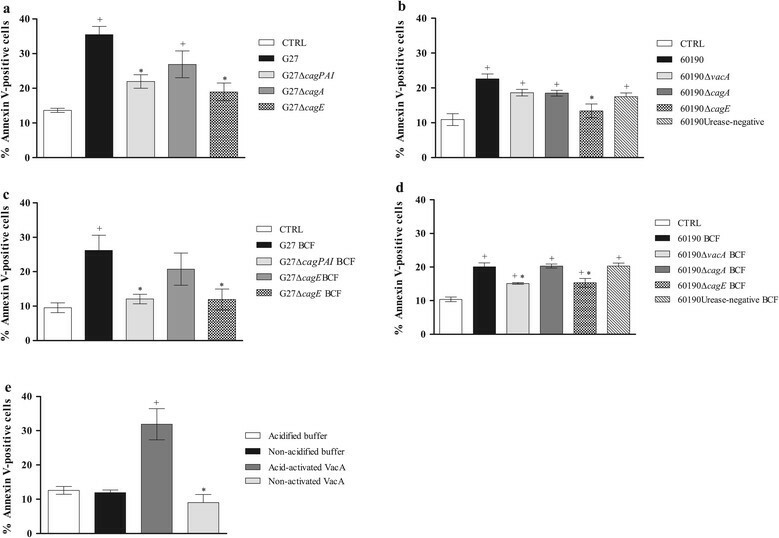 Cells were washed in cold Annexin V buffer (10 mM HEPES, 140 mM NaCl, 2.5 mM CaCl2) prior to treatment with FITC-labeled Annexin V (BD, Milan, Italy) for 15 min at room temperature. Annexin V binding was evaluated by using a two laser equipped FACSCalibur apparatus and the Cell Quest analysis software (Becton Dickinson, Mountain View, CA). All statistical analyses were carried out using GraphPad Prism version 5.04 for Windows (GraphPad Software, San Diego, CA, USA). Survival curves were plotted using the Kaplan-Meier method, and differences in survival were calculated using the log-rank test for multiple comparisons. Differences were considered statistically significant at P < .05. LD50 values of H. pylori strains were calculated as described previously . Briefly, GraphPad Prism was used to fit a curve to the infection data of the following form: Y = [A + (1 − A)]/[1 + exp(B − G xlnX)], where X is the number of viable bacterial cells injected, Y the fraction of larvae killed by the bacterial solution, A is the fraction of larvae killed by the control solution, and B and G are curve-fitting constants automatically calculated by GraphPad Prism. LD50 was calculated as the value of X that corresponds to Y = 0.5. All experiments were performed at least three times and the results were shown as means ± SEM. Differences between mean values were tested for significance by performing either unpaired, two-tailed Student’s t-tests or one-way ANOVA analysis followed by Tukey’s multiple-comparison test, when appropriate. A P value <0.05 was considered to be statistically significant. We examined the susceptibility of G. mellonella to wild-type H. pylori strains G27, 60190 and M5, which are widely used for molecular pathogenesis studies. G. mellonella larvae were injected with 1 × 104, 1 × 105, 1 × 106 and 1 × 107 CFUs of G27 and 60190 wild-type strains and incubated at 37°C up to 96 h. As shown in Figure 1A, 1B and 1C, H pylori strains G27, 60190 and M5 caused a time- and dose-dependent death of larvae (p < 0.0001). The percentage of surviving larvae at 24 h after infection with increasing doses of wild-type strains G27, 60190 and M5 ranged between 97% and 33%, 100% and 65%, and 100% and 74%, respectively. No mortality was observed in G. mellonella larvae either non-infected or PBS-injected (Figure 1A, 1B, 1C). Since the dose of 1 × 106 CFUs/larva allowed to observe clear-cut differences in virulence potential, this concentration of bacterial suspension was chosen as the optimal dosage for the subsequent virulence studies described in this paper. As shown in Figure 1D, wild-type strain G27 showed significantly increased mortality compared to wild-type strains 60190, and M5 (P < 0.0005). Separately, the 50% lethal doses (LD50) of G27, 60190, and M5 were determined in G. mellonella. The analysis of LD50 doses of H. pylori wild-type strains tested showed that G27 was more virulent than 60190 and M5, with LD50 values at 48 h of 2.78 ± 0.4, 6.1 ± 0.4 and 12.8 ± 0.3 × 105 CFUs, respectively (Table 1). Collectively, these results demonstrate that G. mellonella is susceptible to H. pylori infection, in a time- and dose-dependent manner. Survival of G. mellonella following infection by H. pylori strains. Kaplan-Meier survival curves of G. mellonella larvae after 24 h-96 h from injection with 1 × 104, 1 × 105, 1 × 106 and 1 × 107 CFUs of wild type strains G27 (panel A), 60190 (panel B), M5 (panel C) are shown. Kaplan-Meier survival curves of G. mellonella larvae after 24 h-96 h from injection with 1 × 106 CFUs of wild-type H. pylori strains G27, 60190 and M5 (panel D) are shown. The data shown are means ± SEM from three independent experiments recorded for 96 h. Differences in survival were calculated using the log-rank test for multiple comparisons. Differences were considered statistically significant at P < 0.05. PBS, phosphate-buffered saline. *The LD50 values were expressed in Colony Forming Units (CFUs). To identify bacterial virulence factors responsible for H. pylori-induced killing of G. mellonella larvae, we compared the effects of wild-type strains G27, 60190 and M5 with those of their respective mutants in selective virulence factors. The survival percentages of a group of 10 G. mellonella larvae during 72 h post-infection with 1 × 106 CFUs of bacterial suspension were analyzed. As shown in Figure 2A, the wild-type strain G27 showed a statistically significant higher virulence compared with G27ΔcagPAI, (i.e., the G27 isogenic mutant in which the entire cag PAI has been deleted), or G27ΔcagA, or G27ΔcagE (i.e., the G27 isogenic mutants in the effector protein CagA or in the regulatory protein CagE of the type IV secretion system, respectively). Indeed, we found 15% of larvae and no larvae alive after respectively 24 h and 48 h infection with wild type G27 strain, while 55%-70% and 40-45% of larvae alive after 24 h and 48 h infection with mutant strains. Moreover, the wild-type strain 60190 showed a statistically significant increased virulence compared with its isogenic mutants defective in either CagA, or CagE, or VacA as well as with its spontaneous mutant defective in urease at 48 h (Figure 2B). In contrast, there was no significant difference between wild type strain M5 and its GGT-defective isogenic mutant M5 ggt::aph at any time post-infection (Figure 2C). Ability of bacterial suspensions of 1 × 10 6 CFUs wild-type strain G27 and their mutants (panel A), wild type strain 60190 and their mutants (panel B) and wild type strain M5 and ggt -mutant (panel C) to kill G. mellonella larvae at different time points. Values represent the mean (±SEM) of three independent experiments. + P < 0.05 vs control (ANOVA). *; * P < 0.05 vs wild-type strain (ANOVA). CTRL, control. Concordantly, LD50 values of H. pylori mutant strains defective in either VacA, or CagA, or CagE, cag PAI or urease- but not GGT-defective mutant, exhibited slower killing action than their respective wild type strains (Table 1). Also, all wild type strains G27, 60190 and M5 and their respective mutant strains showed a statistically significant effect on killing of G. mellonella larvae compared with control non-infected larvae (p < 0.05) (Figure 2A-C). Taken together, the data shown indicate that killing of larvae by H. pylori was at least in part dependent on the expression of a functional cag PAI, CagA, VacA cytotoxin and urease but independent of GGT. We next determined whether death of G. mellonella was associated with the growth of H. pylori wild-type and mutant strains in the infected larvae. The larvae were injected with 1 × 106 CFUs of H. pylori strains as described above and the number of viable bacteria within the hemolymph of G. mellonella infected larvae was determined after every 24 h interval. As shown in Table 2, wild-type and mutant H. pylori strains showed similar time-dependent increases of 1-log in the number of bacteria with no significant differences observed among strains (P > 0.05). The above data suggest that H. pylori is able to replicate in G. mellonella larvae independently of the strain virulence and that differences in killing observed between wild-type strains and mutants are not due to impaired ability of mutants to replicate into the infected host. The number of viable bacteria in infected larvae were determined as described in the Methods section and expressed in CFUs. To evaluate whether the killing of G. mellonella larvae by H. pylori was dependent on a soluble bacterial virulence factor(s), the effect of BCFs from G27, 60190 and their mutants and purified VacA on killing of G. mellonella larvae was investigated. As shown in Figure 3A and 3B, BCFs from wild-type strains G27 and 60190 strains caused a time-dependent death of G. mellonella larvae with 10% and 35% of survival after 72 h of injection, respectively. Also, BCFs from wild-type strain G27 induced statistically higher killing of G. mellonella larvae than G27ΔcagPAI, G27ΔcagA and G27ΔcagE isogenic mutant strains at 24 h, 48 h and 72 h post injection respectively; similarly, BCFs from wild-type strain 60190 induced higher killing of larvae than 60190ΔcagA at 48 h and 72 h, and 60190Urease-negative mutant at 72 h post-injection. No mortality was observed in the G. mellonella larvae injected with uninoculated broth filtrate taken as a control (Figure 3A and 3B). Moreover, injection of acid-activated VacA cytotoxin from 60190 H. pylori strain caused time-dependent death of larvae, with 31% survival at 24 h post-injection and no larvae alive at 96 h post-injection. On the contrary, injection of non-activated VacA caused death of 10% of larvae, injection of acidified or non-acidified control buffers caused no deaths of larvae (Figure 3C). These data indicate that the effect of H. pylori on killing of larvae is mediated at least in part by bacterial soluble virulence factors, including VacA cytotoxin, CagA and cag PAI-encoded proteins. Ability of broth culture filtrates from 1 × 10 6 CFUs wild-type strain G27 and their mutants (panel A), wild type strain 60190 and their mutants (panel B) and VacA cytotoxin (panel C) to kill G. mellonella larvae at different time points. Values represent the mean (±SEM) of three independent experiments. + P < 0.05 vs control (ANOVA); * P < 0.05 vs wild-type strain (ANOVA). CTRL, control. Because it has been shown that H. pylori triggers the apoptotic program in different experimental systems ,,,,,, we evaluated whether the killing of G. mellonella larvae by H. pylori might be mediated also through induction of apoptosis. To address this issue, we evaluated annexin V binding on hemocytes from G. mellonella larvae injected with bacterial suspension or BCFs of wild-type strains and mutants or purified VacA cytotoxin. As control, annexin V binding on uninfected hemocytes was analyzed. As shown in Figure 4A, H. pylori wild type strain G27 increased annexin V staining in G. mellonella hemocytes by 3.5-fold compared with control uninfected larvae, while G27ΔcagE and G27ΔcagPAI increased annexin V staining by approximately 2-fold (p < 0.05 vs G27 strain). Concordantly, H. pylori wild type strain 60190 increased annexin V staining in G. mellonella hemocytes by approximately 2.5-fold, while the 60190ΔcagE demonstrated a significantly less capacity to bind the annexin (Figure 4B). These data indicate that H. pylori induction of apoptosis in G. mellonella hemocytes is at least in part dependent on the expression of genes in the cag PAI. Determination of Annexin V binding on hemocytes from G. mellonella larvae injected with H. pylori bacteria suspensions, BCFs or purified VacA cytotoxin. Percentage of Annexin V-positive hemocytes of G. mellonella larvae after 3 h from injection with bacterial suspensions of wild-type strain G27 and their mutants (panel A), bacterial suspensions of wild-type 60190 and their mutants (panel B), BCFs of wild-type strain G27 and their mutants (panel C), BCFs from wild-type 60190 and their mutants (panel D) and purified VacA cytotoxin (panel E). As control, Annexin V binding on non-treated hemocytes was always performed. Values represent the mean (±SEM) of three independent experiments. + P < 0.05 vs control (ANOVA);* P < 0.05 vs wild-type strain (ANOVA). CTRL, control; BCF, broth culture filtrate. We next evaluated the effect of soluble virulence factor(s) on apoptosis in G. mellonella hemocytes. As shown in Figure 4C, BCFs from G27 increased annexin staining by 2.5-fold, while BCFs from G27ΔcagE and G27ΔcagPAI demonstrated a significantly lower capacity to bind the annexin compared with BCFs from G27 strain (p < 0.05). Also, BCFs from H. pylori wild type strain 60190 increased annexin V staining in G. mellonella hemocytes by approximately 2-fold, while the 60190ΔvacA and 60190ΔcagE mutants demonstrated a significantly lower capacity to bind the annexin compared with BCFs from 60190 strain (P < 0.05) (Figure 4D). 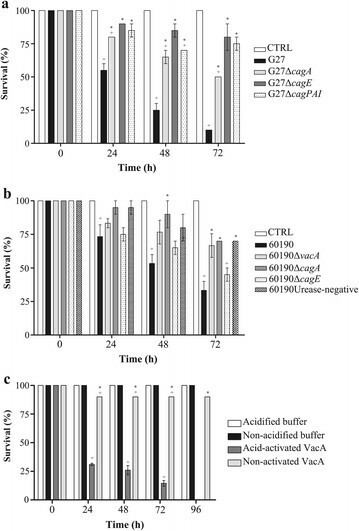 Moreover, activated VacA increased annexin V staining of G. mellonella hemocytes by 3-fold compared with non-activated VacA or control buffer or (p < 0.05) (Figure 4D). This suggests that H. pylori induction of apoptosis in G. mellonella hemocytes is, at least in part, dependent on the release of soluble virulence factor(s) including VacA cytotoxin. In the present study, we provide evidence that the larva of the wax moth G. mellonella can be used as a new and simple infection model to study H. pylori virulence. We show that a panel of wild-type and mutant strains selectively defective in specific virulence factors are able to infect and kill G. mellonella larvae in a dose- and time-dependent fashion. All H. pylori strains analyzed are able to increase cell number by 1-log during infection of G. mellonella larvae, thus suggesting that H. pylori strains are able to survive and replicate in larvae. Our data also show that wild-type strain G27 is more virulent than wild-type strains 60190 and M5 and that H. pylori mutant strains defective in either VacA, CagA, CagE, cag PAI, or urease but not GGT-defective mutants, are less virulent than the respective parental strain. The increased ability to kill larvae of G27 strain compared with 60190 and M5 strains might be dependent on different genetic background and/or virulence factors different from VacA and CagA. That killing of larvae is dependent on the expression of a functional cag PAI and VacA cytotoxin is in accordance with previous data obtained in in vitro models showing that H. pylori-dependent epithelial cell damage and apoptosis of monocytes is dependent on VacA and cag PAI determinants . Our data are also in agreement with those obtained in rodent models of H. pylori infection, in which inflammation and gastritis and apoptosis of monocytes and lymphocytes is dependent on the expression of both cag PAI and VacA ,. While previous studies have shown that H. pylori GGT favours colonization of the gastric mucosa and more severe gastroduodenal diseases during infection in vivo ,, here we found no difference in killing of G. mellonella larvae between the GGT-defective isogenic mutant and its parental wild-type H. pylori strain. This discrepancy may depend on differences between G. mellonella and rodent models of infections and/or different experimental conditions. We also evaluated the effect of H. pylori soluble/secreted virulence factors in G. mellonella larvae. In accordance with previous findings obtained in human and rodent models both in vitro and in vivo –,,, we demonstrate that VacA, CagA and other cag PAI-encoded determinants are important soluble virulence factors of H. pylori strains. 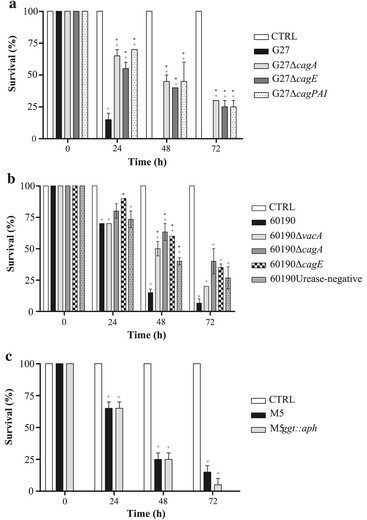 That soluble CagA mediates the killing of G. mellonella larvae is also in agreement with previous studies in a transgenic Drosophila model with inducible CagA expression which demonstrate that H. pylori CagA functions as a eukaryotic Grb2-associated binder (Gab) adaptor protein to activate the phosphatase SHP-2 and promote epithelial disruption or apoptosis through activation of the JNK signaling pathway ,. Taken together, the data here presented demonstrate that H. pylori infection of G. mellonella larvae is a suitable model to study differences in virulence between strains. It is now well-known that H. pylori exhibits a high genetic and functional diversity in the cag PAI  as well as a high whole-genome variability among strains isolated from subjects either asymptomatic or affected by different gastroduodenal diseases –. In this respect, the infection of G. mellonella larvae may represent a useful model for the screening and the identification of virulence determinants in whole genome sequenced H. pylori strains. Additional advantage provided by G. mellonella larvae infection model is the possibility to study the effect of strains and soluble virulence factors on the hemocytes, insect immune cells that are able to phagocyte bacterial and fungal cells  and to identify molecules responsible for immune evasion by H. pylori. Our data demonstrate that both H. pylori cells and soluble virulence factors induce apoptosis of insect hemocytes and that the effect is dependent on VacA and CagA and on the expression of a functional cag PAI. That CagA and cag PAI induce apoptosis of hemocytes is in agreement with previous studies showing that ectopic CagA expression induces apoptosis of epithelial cells of the Drosophila larval wing imaginal discs  and a functional cag PAI induces apoptosis of human monocytes . Moreover, the effect of VacA on apoptosis of insect hemocytes is consistent with a previous study showing that VacA induces cell death in gastric epithelial cells , and inhibits dendritic cell maturation in neonatally infected mice . Therefore, based on the data shown herein, we have identified specific bacterial virulence factors such as CagA, cag PAI components and VacA, which are able to evade host response of insect larvae. A limitation of this study is that the strains used in our experiments differ in origins and lab passages. This might cause the various H. pylori mutants have additional uncharacterized differences compared to the single wildtype parental strain used. However, we were able to compare and duplicate the effect of mutants in identical genes, i.e. cagA and cagE, in two distinct genetic backgrounds, i.e. G27 strain versus 60190 strain. This issue might more properly be addressed by comparing the killing activity in G. mellonella larvae of several datasets of wild-type and isogenic mutants displaying different genetic backgrounds. Based on the data shown herein, we hypothesize that CagA is injected into haemocytes via a type IV secretion system. Further studies will be necessary to demonstrate this hypothesis. The NFkB pathway, which has been demonstrated to be activated by CagA and cag PAI components during apoptosis of mammalian monocytes  and which is expressed in G. mellonella larvae , should be analyzed in hemocytes following H. pylori infection. In addition to the effects on hemocyte apoptosis, it should be interesting to study if H. pylori is able to colonize and induce damage to the midgut of G. mellonella larvae, as has been recently demonstrated for C. jejuni. The above all experiments should be the matter of a future investigation. In conclusion, the model of G. mellonella larvae described herein represents a reliable and inexpensive model of H. pylori infection. Although the G. mellonella infection model cannot replace well-established and more “physiological” in vivo experimental models in the assessment of pathogenic mechanisms underlying H. pylori-related human diseases, it could be of use, and less expensive, for the evaluation of the effect of H. pylori virulence factors on specific cell functions. This experimental model may reduce dependence on mammalian infection models and provide several applications for the Helicobacter research community such as the ability to distinguish between virulent and non-virulent H. pylori isolates, the identification of putative virulence genes through comparative genomics studies and the identification of novel molecular targets for antimicrobial therapy and vaccine development. Vittorio Ricci and Raffaele Zarrilli share last authorship. This work was supported in part by grants from the Italian Ministry for University and Research (Progetto di Ricerca di Interesse Nazionale n. 2009A37C8C_002; to Vittorio Ricci) and Fondazione Cariplo (grant n. 2011–0485; to Vittorio Ricci). Conceived and designed the experiments: MG, GR, MR, VRI, RZ. Performed the experiments: MG, ATP, VRU. Analyzed the data: MG, GR, MR, MT, RZ. Wrote the manuscript: MG, VRI, RZ. All authors read and approved the final manuscript.